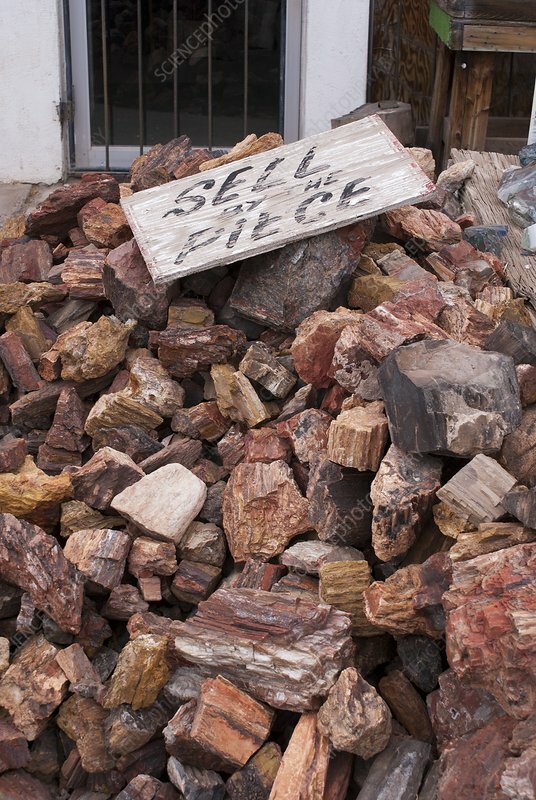 Petrified wood for sale at rock shop in Holbrook, Arizona, USA. Millions of years ago fallen trees were buried by a mixture of silt, mud and volcanic ash. The sediment isolated them from the influence of the atmosphere and slowed their decay. Silica-laden groundwater seeped through the logs, infusing the cells with silica and replacing the original tissues. Later the silica crystallised into quartz and the logs were preserved as petrified wood. Colours are the result of different minerals in the silica-saturated waters.